A few weeks ago I decided to use up a large stash of aran or worsted weight cotton. 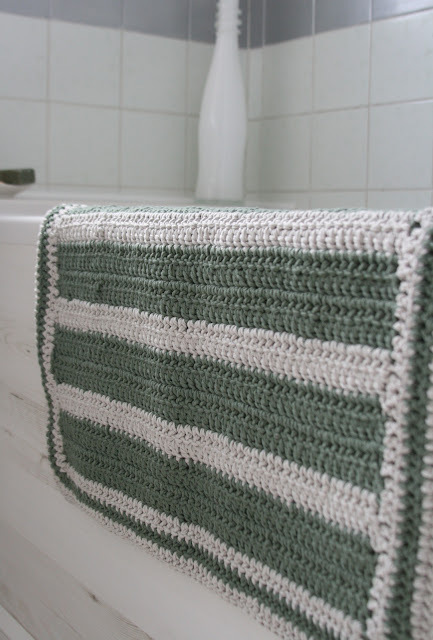 We had just begun renovating our tired 1970s bathroom on an extremely limited budget and a simple, quick to make, washable bath mat from stash yarn was just the ticket! I decided on crochet as speed was of the essence. I also decided to double up the yarn to really get it moving and here is the finished result. Pretty fab! A lot of people on twitter were asking all about it and whether it would be released as a pattern. Now I really don't think even as a full time designer I can claim the finished product as a pattern but I thought it would be really nice to share the simple instructions with everyone here so that you can use whatever stash you may have to create your own version. 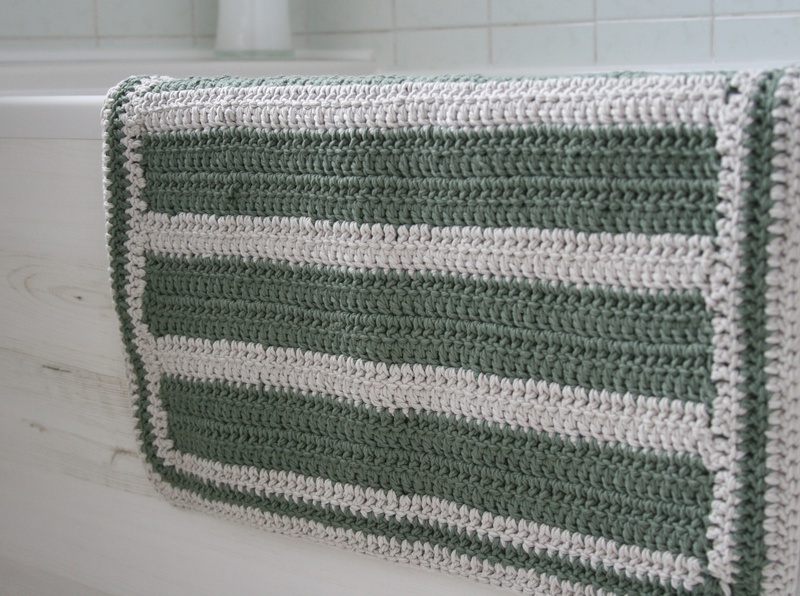 I've used UK crochet terms for the instructions but I've added a little translation too. Using MC doubled, make 60 chains. ** Continuing in MC, work 6 rows of trebles across all sts. Change to CC doubled and work 2 rows of trebles. Repeat from ** a further 5 times, then work 6 rows of trebles in MC once more. Commencing from the same point work a row of trebles using CC doubled up to first corner. Work three trebles into corner stitch then work along first side edge working 2 trebles along the side edge of each treble row until corner is reached. Again work 3 trebles into corner. Work a row of trebles along cast on chain and then 3 trebles into the next corner. Work along second side edge again working 2 trebles along this side edge as for the first. At the last corner work 3 trebles into corner then slip stitch to beginning st on row. Change to MC doubled and work a row of trebles in the same way working additional trebles up to new corner stitches and then working 3 trebles into each one. When row completed change back to CC doubled and work one final row in the same way. On the wrong side darn in ends and press mat. And two nights work later a finished bath mat! 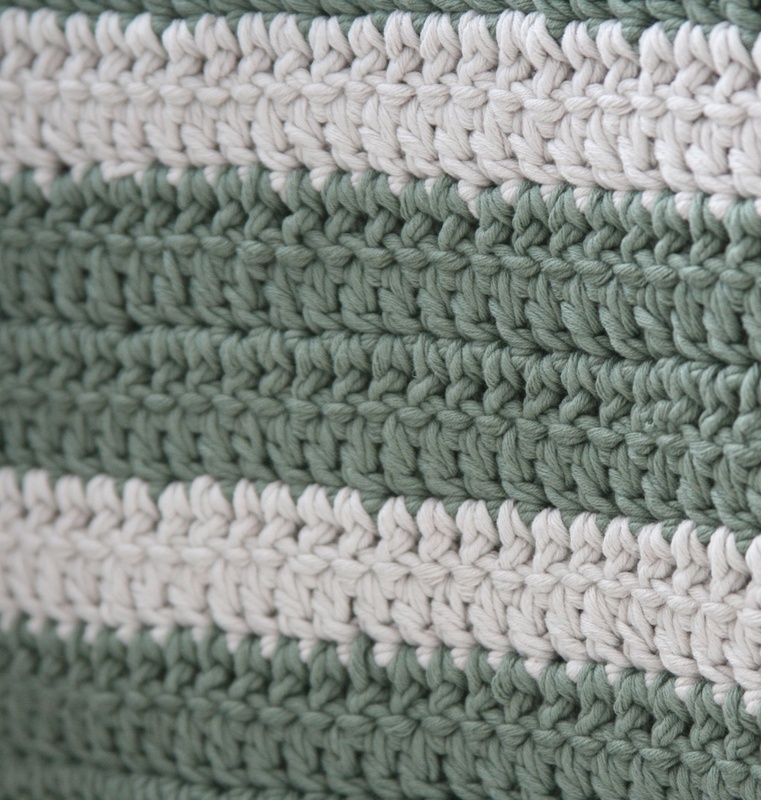 You can use any two colours or any combination of colours depending on what cotton you have in your stash. 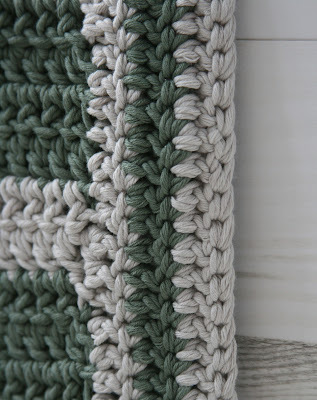 This particular cotton is a soft matt rather than a crisp mercerised cotton so even doubled it was still reasonably soft to work with. Over to you, have fun! 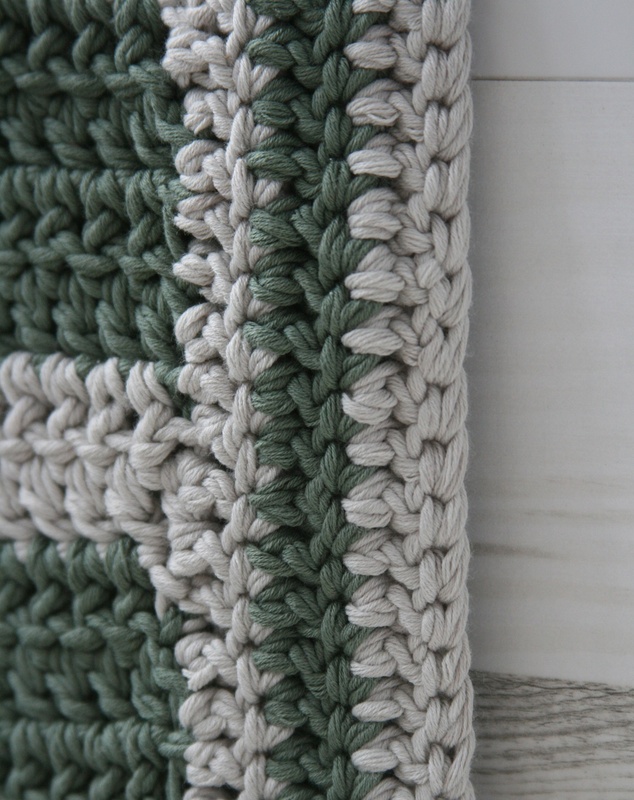 Certainly a great incentive for me to get a move on and learn how to crochet! Is this the dodgiest knitting pattern cover ever?